In 1969, Emerald Bay was designated a National Natural Landmark for its brilliant panorama of mountain-building processes and glacier carved granite. The natural beauty, geology and history of this unique island make it one of the highlights of any visit to the Lake Tahoe area. The park features Vikingsholm, one of the finest examples of Scandinavian architecture in the western hemisphere. The "Tea House" on Fannette Island, the only island to be found in all of Lake Tahoe. Emerald Bay was designated an underwater state park in 1994. It is the resting place for many boats, launches and barges used in the lake before the turn of the century, during the heyday of Emerald Bay Resort and used in the construction of the Vikingsholm mansion. 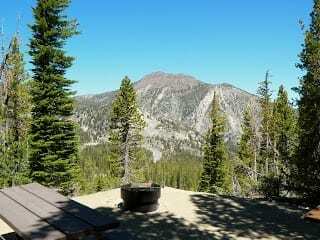 The park is located 22 miles south of Tahoe City. Vikingsholm can be reached by parking in the Harvey West parking lot by Highway 89 at Emerald Bay. Take the trail, which is one mile in length and drops 500 feet in elevation to the house. Fannette Island is located in the bay on the west shore of Lake Tahoe. The Boat Camp is on the north side of Emerald Bay, about 1/2 mile east of Fannette Island located in the bay on the west shore of Lake Tahoe, at the site of the old Emerald Bay Resort. Seasons/Climate/Recommended clothing ; Summer temperatures range from about 75 degrees during the day to the low 40s at night, and winter temperatures average from a high of 40 to a low of 20 degrees; during extremely cold winters Emerald Bay freezes over.